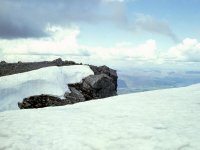 Ben Nevis is Britain's highest mountain. 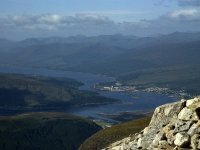 It could so easily have stood in one of the more thinly populated and remoter regions of the Scottish Highlands, in which case its ascent would be a considerable challenge, but fortunately it stands on the west coast directly above the town of Fort William and is readily accessible. 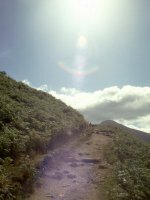 Nevis stands 4,408 ft (1344 metres) above sea level and an ascent from Fort William means a sea-level start. 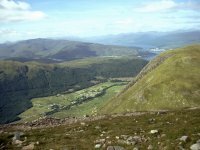 There is a well maintained track up to the summit from Achintee farm just outside the town on the north side of Glen Nevis, from where it's a four mile walk to the summit - or five miles, if you start from the town. The ascent is straightforward and any reasonably fit person will manage it, but it takes a lot of sustained effort. 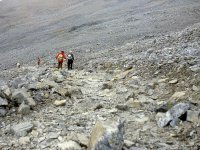 On average it takes five hours to climb, and another three hours to descend. 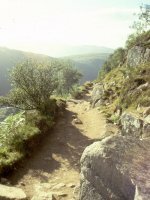 The path is a relic of a pony track constructed in the nineteenth century to serve a weather observatory on the summit. Some sources say that the observatory also functioned as a rudimentary hotel. The observatory no longer exists, having succumbed to the ravages of wind, snow and ice. 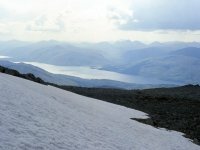 The Ben is a place of extreme weather at times, and the summit plateau is snowbound for six months at a time and shrouded in cloud cover for an average 300 days per year, but on a sunny day the Ben attracts hundreds of climbers - many of them ill shod and unprepared for the conditions. The ascent of the Ben is a natural attraction for stunts - pushing bedsteads all the way to the top for charity seems to be a favourite - and the occasional car has been known to make it, although the most well known attempt (reputedly a model T Ford in the 1930's) is said to have taken three days and involved a great many running repairs. 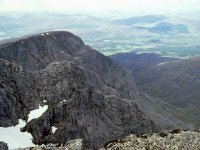 Mountaineers will tell you that the pony track or "tourist route" is bland and unexciting, and that if you want a harder challenge that reveals the "real" Ben then you should climb it via Carn Mor Dearg to the north and walk across the famous narrow arete onto the Ben itself. 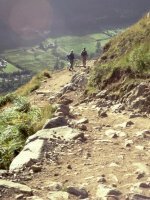 That's a walk for the adventurous and super fit rather than the likes of you and me, but try it if you wish.You'll get a superb view of the cliffs of the Ben's north face, the highest in Britain at 2000 feet plus. Just don't expect me to follow you. 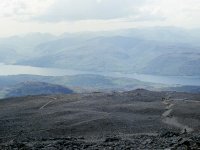 I've climbed the Ben three times, the first occasion being in May 1981. 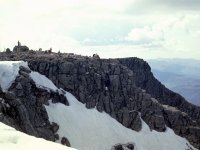 The images depicted here cover two of my three ascents, those of 1981 and 1986. 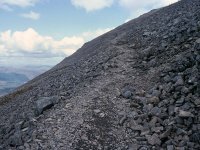 The Ben Nevis ascent path. 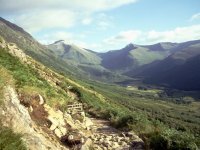 Starting from Achintee farm, the path ascends the flanks of Nevis's outlier, Meall an t-Suidhe. 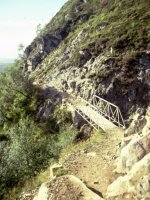 This the first footbridge, located just above Glen Nevis youth hostel. 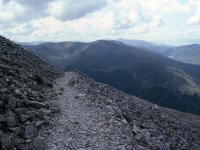 The path winds around the shoulder of Meall an t-Suidhe. 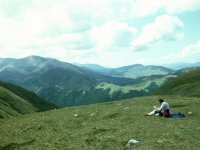 The gradient, while not excessively steep, is relentless and the climb is somewhat tedious. Resting at the col between Meall an t-Suidhe and Ben Nevis. 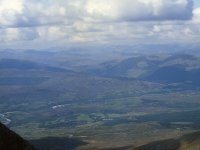 The col is the psychological half-way point, about two hours' climb from Fort William or ninety minutes from Achintee. 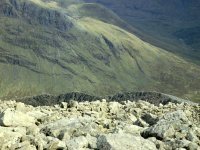 From the col the path begins the ascent of Ben Nevis proper. 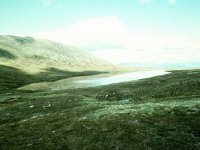 Looking back we see Lochan Meall an t-Suidhe. 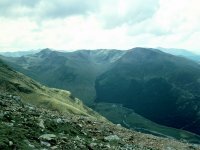 We're looking across Glen Nevis to the southwest. Crossing a substantial stream, we head towards the first of the eight great zigzags in the path. Loch Linnhe starts to come into view to the southwest. On the first zigzag, a few hundred feet above the col. Lochan Meall an t-Suidhe is starting to look insignificant. Gairlochy is coming into view beyond the col.
We're on the second of the eight zigzags, looking south. Stob Ban faces Nevis across the glen, with the peaks of Glencoe coming into view beyond. 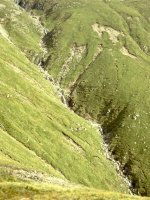 The third zigzag, at about 940 metres of altitude (very slightly below 3000 ft). The vegetation has all but disappeared now. This is where the casual tourists become very dispirited to learn that there are still 1500 feet to go to the top. Starting on zigzag number four, at 1000 metres. High on the shoulder of the Ben now, looking back along zigzag six at over 1100 metres. I think I actually took this on the way down again but it's advantageous to place it at this point in the narrative. The gradient has lessened as the start of the summit dome. is reached. We're looking at the elbow formed by the confluence of Loch Linnhe with Loch Eil. The top reaches of zigzag six. 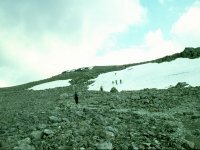 Most of the climbing efort is behind us now but the summit is still a kilometre away over rough terrain. The scene looking back from zigzag seven towards Loch Linnhe and Loch Eil. 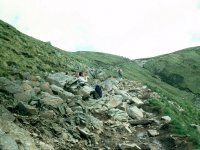 Zigzag eight, at an altitude of 1200 metres. Still another 144 metres (nearly 500 feet) to climb. The top of the zigzags at about 1250 metres. This is where you find that there is, in effect, a second summit dome ahead perched on top of and to the rear of the first. There are still substantial snowfields at this height despite this being late May. 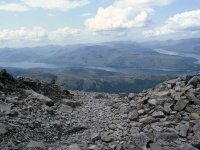 Carn Dearg, with Loch Linnhe beyond, seen from about 1280 metres. 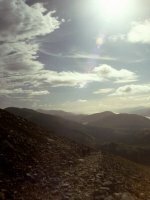 The final approach to the top of the Ben. There's nothing here but frost-shattered rock. Nevis proves to have a tertiary summit dome, even higher and further back than one expects. To reach it one has to pass the fearsome gullies in the north face. 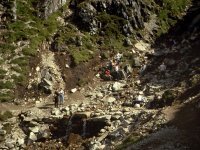 One of the gullies leading down into Coire Leis. 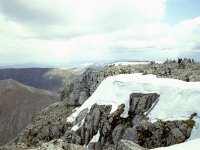 Looking back to Carn Dearg across Coire na Ciste. 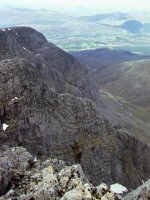 The top of Ben Nevis - one of the buttresses of the north face. Just a couple of hundred metres from the actual summit now. The summit. 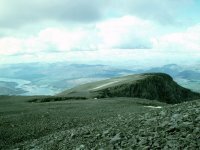 The highest point in Britain, 4408 feet (1344 metres) above sea level, and a magnet for tourists as well as hillwalkers. The structure to the right is a crude shelter. There was once a weather station on the summit, which operated in the late nineteenth century. So much to photograph up here! We're looking towards the east top, with Aonach Mor and Aonach Beag behind. 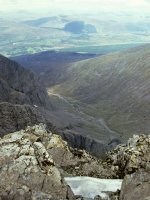 Looking across the gullies towards Carn Dearg. 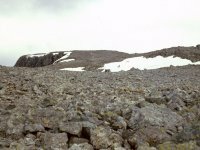 The awesome sight of Carn Dearg. 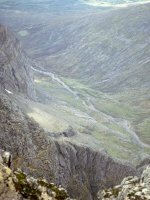 Here we're looking down the length of Coire na Ciste, the ravine between Nevis and its neighbour, Carn Mor Dearg. 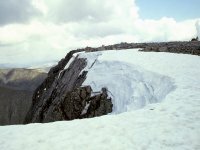 Another view of Coire na Ciste, with Carn Dearg and the cliffs of the north face rising to the left. 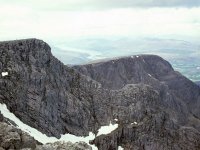 This is said to be the highest cliff face in Britain. 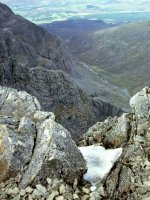 One of the gullies of Coire Leis, with Coire na Ciste beyond. 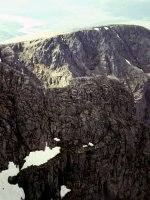 A telephoto shot of Coire na Ciste. 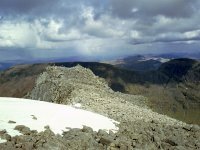 The summit of Ben Nevis from a point near the east top. 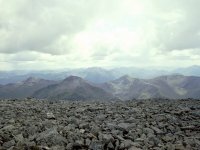 The first shot in the Ben Nevis summit panorama. Looking north, across Loch Lochy, towards Affric and Cannich. Panorama shot 2. Looking north-northeast we see Carn More Drarg in the foreground with part of Aonach Mor beyond to the right. 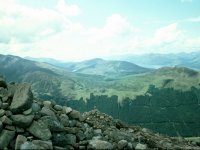 In the distance is Gairlochy and the Great Glen. Somewhere in the far distance is Ben Wyvis. Panorama shot 3. Carn Mor Dearg is in shadow now. Aonach Mor rises beyond. Over in the distance is Spean Bridge. Mealfuarmonnaidh rises to the north of the unseen Loch Ness. Panorama shot 4, looking northeast. Beyond the east top is the long ridge of Aonach Mor. 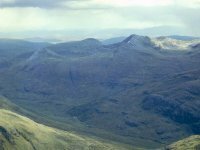 Beyond it we see the Monadhliath, and possibly Greag Meagaidh. 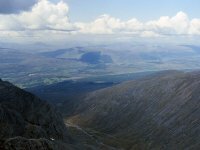 Panorama shot 5, in which we see the abrupt rise of Aonach Beag to the right with the Monadhliath beyond. The Cairngorms are in the far distance. Panorama shot 6, looking east. 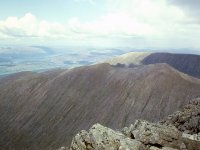 Aonach Beag is to the left., with the Ben Alder hills and the Mounth beyond. 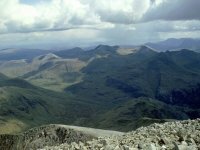 The Grey Corries are well seen here. 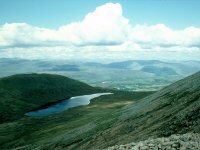 Ben Alder, the Mounth and Sciehallion are in the far distance. Panorama shot 8, looking east-southeast. 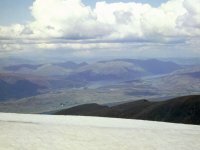 The Mamores, notably Binnein Mor, are coming into view. Schiehallion and Ben Lawers are somewhere out there. 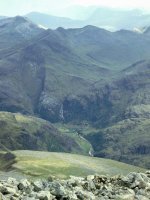 Looking downwards from the above shot to the Carn More Dearg arete, with Steall in upper Glen Nevis seen beyond. Panorama shot 9, looking southeast. 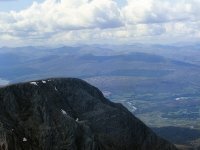 The western Mamores are in view across upper Glen Nevis, with the unseen Rannoch Moor beyond. The Blackmount is starting to come into view to the far right. Schiehallion is somewhere in the distance. A magnificent sight - Steall Waterfall, nearly four thousand feet below but ckearly audible, surrounded by the mountains known as the Ring of Steall - An Gearanach, An Garbhanach and Ston Coire a' Chairn. 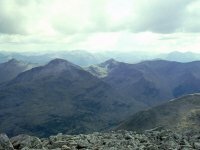 In the background we can see Meall a' Bhuiridh and Creise in the centre of shot, with the Buachaille Etive Mor to the right. 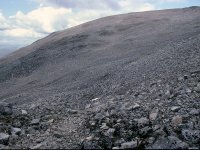 Panorama shot 10, looking south-southeast, and arguable the highlight of the summit vista. 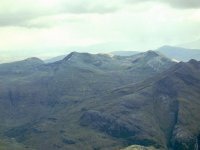 The Ring of Steall is in the foreground, dominated by Sgurr a' Mhaim and Am Bodach, while to the rear are the mountains of Glencoe, topped by Bidean nam Bian. 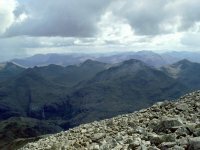 And to the rear of Glencoe are peaks too many to mention - the Blackmount, Glen Etive, Ben Starav, Glen Falloch and Arrochar ranges. 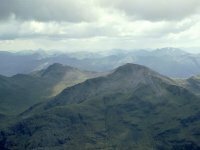 A close-up of the above scene, with Am Bodach and Sgurr a' Mhaim a couple of miles away, Bidean nam Bian behind to the right, and the skyline crowded with summits. Panorama shot 11, the view just east of south. 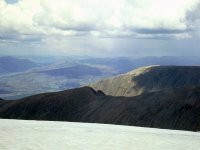 Sgurr a' Mhaim and Stob Ban take centre stage with their quartzite tops, and the snow-flecked Bidean nam Bian dominates the scene to the rear. To the right, Beinn a' Bheithir is coming into view. 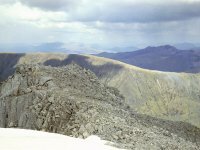 A bit of a zoom in again, giving the shapely cone of Stob Ban pride of place. 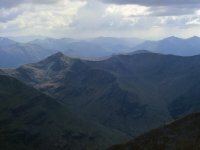 A zoom-in due south, with Stob Ban and Mullach nan Coirean holding the attention and Beinn a' Bheithir dominating the rear view towards the right. Panorama shot 12, looking southwest. We're seeing the bulk of Loch Linnhe here, with the Ardgour and Sunart districts beyond. 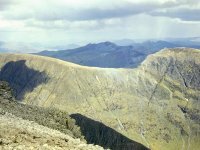 Beinn a Bheithir is on the left. Zooming in on the detail of Loch Linnhe and some of its islands. Oban lays on the coast down there somewhere. 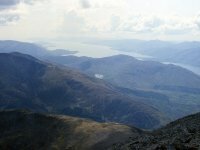 Panorama shot 13, looking west-southwest across Loch Linnhe to the Ardgour and Morven regions. 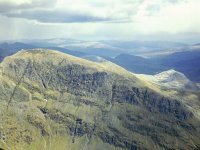 This area lacks Munros yet is full of rugged and shapely summits of lesser height. 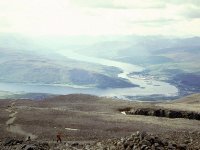 Panorama shot 14, the western aspect, looking across upper Loch Linnhe into Ardgour ane the hills around Glenfinnan and Loch Shiel. 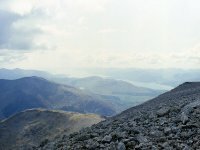 Panorama shot 15, the view west-northwest down the length of Loch Eil towards the Glenfinnan hills and Morar. 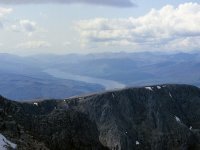 Panorama shot 17, with the Caledonian Canal and the lower Great Glen backed by the myriad hills of Knoydart and Kintail. 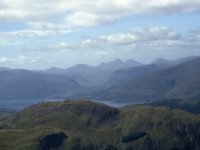 Our final panorama shot, looking north northwest across to Kintail, Torridon and Affric, with Loch Lochy partly in view to the right. 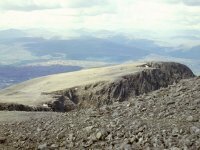 We move forwards five years now, to my second ascent of the Ben in 1986. 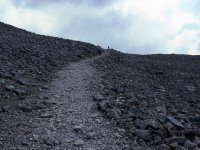 This is the path on the shoulder of Meall an t-Suidhe again. 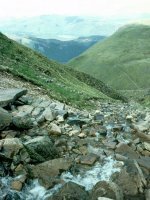 And this is a shot of the Red Burn, the major watercourse that runs down Ben Nevis's south face just to the east of the Meall an t-Suidhe col. Looking back across the watercourse from the same point. 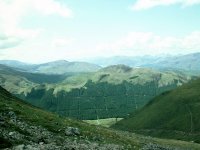 A view of lower Glen Nevis from the zigzags. 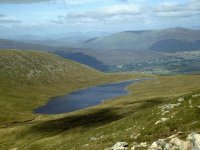 Lochan Meall an t-Suidhe from the same point. 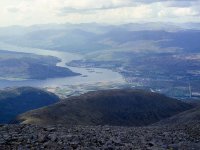 From higher up the Ben, I've zoomed in on the hills of Ardgour across Loch Linnhe. Another closeup, this one of Corpach on Loch Eil. I'd forotten I even had this shot and was so pleased when I rediscovered it. 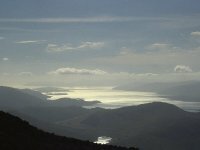 A contre-jour study of Loch Linnhe, seen on the descent. A wide-angle version of the above shot, looking across Lundavra to Loch Linnhe. 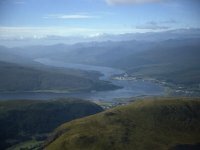 Another view of the confluence of Loch Linnhe and Loch Eil. 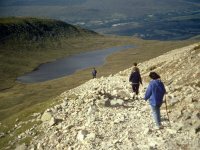 Walkers descending the path, with Lochan Meall an t-Suidhe in the bakground. 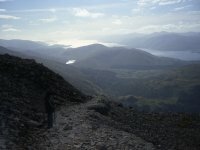 Another contre-jour shot, the path in the foreground and Loch Linnhe and Lundavra, seen across Glen Nevis, in the distance. One of the two aluminium footbridges that cross streams running off the hill. The path just beyond the footbridge seen in the picture above. 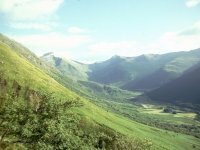 A shot of Glen Nevis from the path. 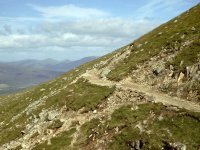 The path descending the shoulder of Meall an t-Suidhe. The Glen Nevis youth hostel is below at this point. 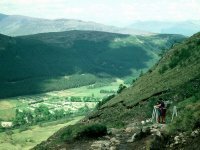 A final view into Glen Nevis as the path approaches Achintee Farm at the end of the walk.